What Day Of The Week Was April 4? 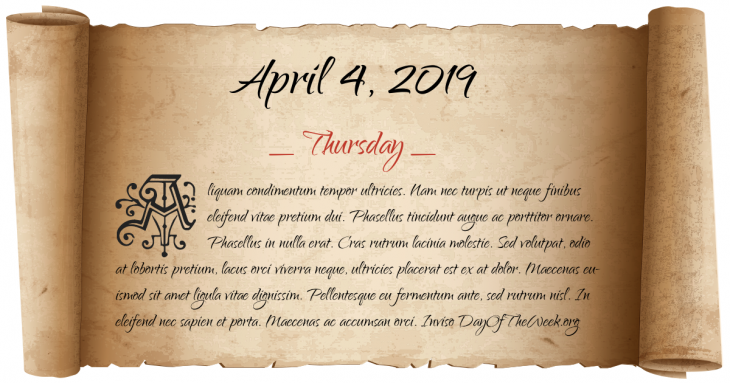 April 4, 2019 was the 94th day of the year 2019 in the Gregorian calendar. There were 271 days remaining until the end of the year. The day of the week was Thursday. Sir Robert Walpole enters office as the first Prime Minister of the United Kingdom under King George I. World War II: American troops liberate Ohrdruf forced labor camp in Germany. Martin Luther King, Jr. delivers his “Beyond Vietnam: A Time to Break Silence” speech in New York City’s Riverside Church. The 2nd Congress of the Communist Youth of Greece starts. Who were born on April 4? Dina Manfredini, Italian supercentenarian living in the United States currently. She is the 2nd oldest living person in the world.